The time between campus placements and the actual joining date is a weird phase. Students are officially placed as early as November, but may officially join their jobs only towards the middle of the following year. It’s often hard for companies to retain a connect with their recruits over this period, and students too are in a strange limbo between college life and the real world. Directi wanted that things be different this year. They decided to step in and surprise their campus recruits this Diwali. And it wasn’t just their future employees they surprised. Directi went a step further and got talking directly to the students’ parents. 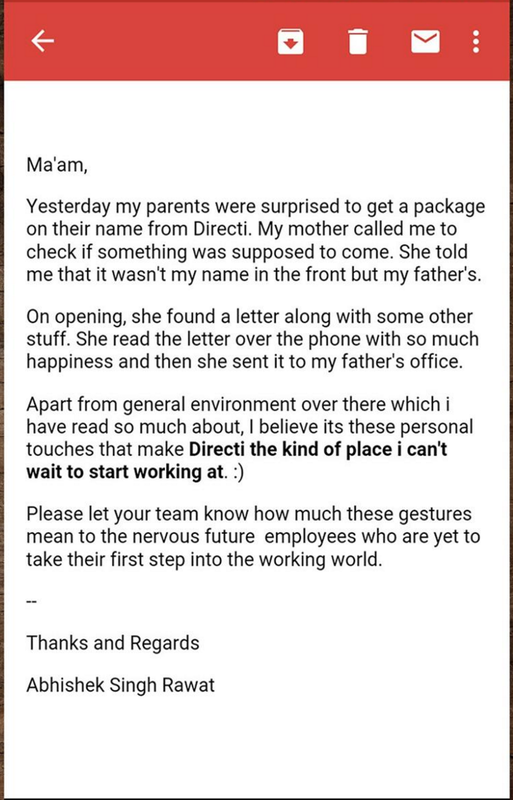 This year, all of Directi recruits’ parents goodies from the company, and a letter directly from CEO Bhavin Turakhia. The letter congratulated the parents for steering their child’s enthusiasm and intelligence towards the right place, and assures them that their kids will be doing impactful work at the company. 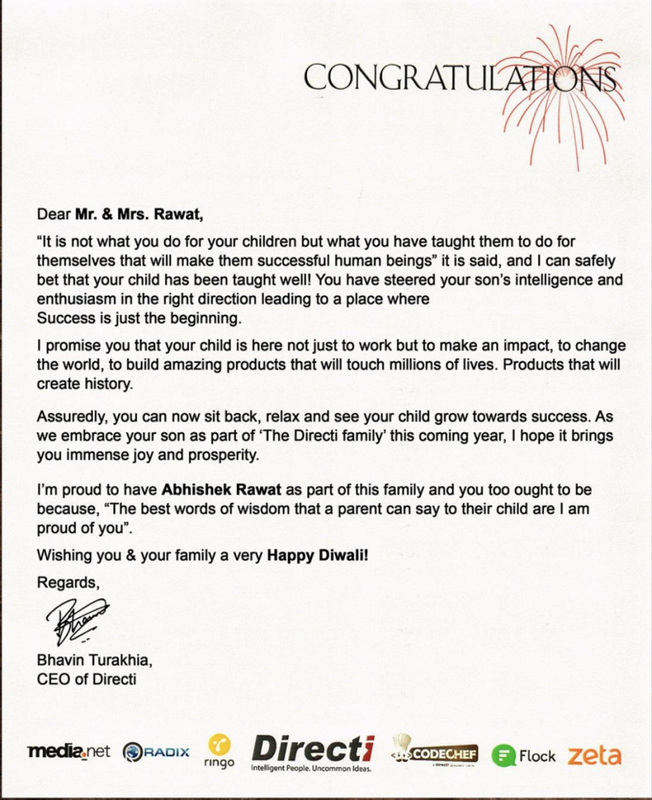 Turakhia welcomed their child into the Directi family, and wished them a happy Diwali. Predictably, parents and students alike were delighted. A Directi employee shared an email that a student had sent the company upon their parents receiving the hamper. Now this is one company that students are going to look forward to working at. Here’s How India is Watching the World Cup From Office Why Zomato Is Publicizing Its Strenuous Work Culture The Secret Behind Ryanair CEO’s Private Taxi How Taking A Leap Of Faith In My Career Paid Off The Chronicles Of A Swindled Freelancer The Comedy Career of Twitter’s Former CEO Overwork Led To The Death Of Sarvshreshth Gupta This Fortune 500 CEO Is “Ashamed” Of His Pay Meet These 11 People Who Quit Their Jobs To Follow Their Heart Have Food Tech Startups Bitten Off More Than They Can Chew?